The P-Series (System D) comparators are hydraulic screw pumps designed for easy, controlled, high pressure generation. 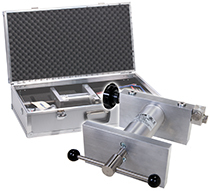 Each comparator includes a 4 connection manifold, which can be used for the reference indicator, the device under test, a fine adjust, an isolation valve, or a fluid reservoir. The adjustable reference pressure port lets you set your reference gauge at the best viewing angle. Three models are available for hydraulic oil, water, or both.